There is a lot in this reading that we just heard – four incidents and a hole. We start with Jesus inviting his disciples to leave everyone and go with him “to a deserted place” to rest. According to Mark, the disciples had just returned from their mission without Jesus to preach and heal, and were reporting back. Surely they needed this rest. Sadly interrupted by needy people But it was not to be. This is where the hole comes. The crowd were waiting for them and Jesus had compassion in them. You will hear this part of the chapter next week. Jesus feeds 5,000 men + women and children, after which (as we pick up the story), Jesus sent the disciples away in the boat, and dismissed the crowd. Then he goes away by himself to pray. 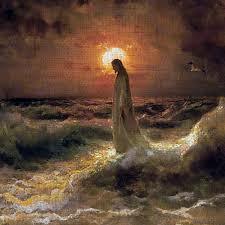 As we heard, when his Prayer time was over, he went looking for his friends, walking on water to reach them – more later. The last incident we read about saw Jesus and the disciples back with crowds of people and Jesus again at work healing. Back to walking on water. Did it happen? I’m not going to debate today whether Jesus really did walk on water. Three of the 4 gospels have this story. Mark, the earliest of the Gospels, Mathew, who based a lot of his writings on Mark, but adds the detail of Peter also walking on the water to meet Jesus until he lost faith he could do it, and John, believed to have written independently of the other three. 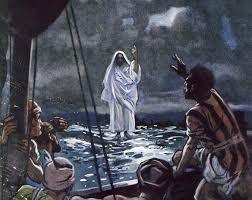 Scholars’ opinions range from: He’s God; of course he can walk on water or (a version of this) the miracle was a hologram version of Jesus; to It was an optical illusion (he was on the shore or a sandbar) to It never happened; it’s a myth! Take your choice. However you interpret it, like so many Bible stories, there is more than one level of meaning in the story. The phrase Walking on Water, like many biblical phrases has been adopted into current parlance and is used without thought of where it comes from. When I worked at the bank we had a performance appraisal every year, and we were graded from Unsatisfactory, right up to Exceptional. I didn’t know anyone who had ever received the Exceptional rating, and I found out why when I tried to rate one of my staff that way. My boss didn’t believe anyone could ever be exceptional. As a result, the office culture claimed that, in order to be rated Exceptional, you had to be faster than a speeding bullet, leap tall buildings with a single bound, and walk on water! You have to be a combination of Superman and Jesus. This is the way walking in water has entered our culture – as one aspect of doing the impossible. According to the story, if taken literally, Jesus could do the impossible, but not the disciples and not us. Haven’t we all been the victim of unrealistic expectations? Public figures get this regularly, especially after they have just been elected or appointed. There is even a name for it – the honeymoon period + that time before the person has done something to make them unpopular. I remember the headline in 2015: “How long will Justin Trudeau’s Honeymoon period last?” For a while, it seemed like he could do no wrong. The same thing happens in other spheres of life. Of course there is the original marital honeymoon, but also the new boss, new pastor or a role model who, eventually, because he or she is human, lets us down in some way. We either accept the other person’s failings, or a divorce happens – marriage breakdown, we leave the job or the church, or we force the other person out. ‘Cause I’m only human, just like you / I been making my mistakes, oh if you only knew / I don’t think you should believe in me the way that you do /’Cause I’m terrified to let you down, oh / If I walked on water, I would drown / ‘Cause I’m just a man, ……. Or woman! … : I walk on water / But I ain’t no Jesus / I walk on water / But only when it freezes. It’s not only leaders and celebrities who get idealized with unrealistic expectations. Just as we have unrealistic expectations of a new boss, (or pastor or neighbour or even spouse) the boss (or whoever) might have unrealistic expectations of us! I doubt there is one of us who, at some time in our life, hasn’t been put on a pedestal, thought of as a role model, felt called to Walk on Water, carried the burden of unrealistic expectations. Wasn’t there a time when, to your children or grandchildren, you could do no wrong? When people relied on you and didn’t want to let them down, but their expectations were unrealistic? Or have you ever been told: “You’re a Christian … how can you say (or do) that?” Haven’t we all wanted to cry out with Eminem I don’t think you should believe in me the way that you do /’Cause I’m terrified to let you down, oh / If I walked on water, I would drown / ‘Cause I’m just a man, ……. Or woman! Where do these unrealistic expectations come from? Sometimes from others. Very often from ourselves!. But they do not come from God. Jesus didn’t call us to be perfect, without flaws. OK, now you’re all thinking of that saying of Jesus in Matthew: “Be perfect as your heavenly father is perfect”. I’m not a Greek scholar, but I looked that up. The word used in Greek, that was translated into Latin as Perfectus, and later into English as perfect is teleios and it can mean ‘perfect’ but is more usually used to refer to maturity or wholeness. In fact anywhere else it is used in the New Testament, it is translated as mature. Be mature is very different from being perfect. Grow up, says Jesus. So what did Jesus expect of us as we grow up, if not perfection? I like Paul’s image (2 Corinthians 4.7) which says that ‘we have this treasure in clay jars, so that it may be made clear that this extraordinary power belongs to God and does not come from us.‘ The Corinthians made various kinds of pots and exported them widely. As well as fancy, highly glazed pottery, some of their pots were made of inferior clay that, when fired, cracked and made great light diffusers. Paul is referring to these pots, when hr describes how God’s extraordinary power chines through us, the inferior pots. Paul’s point is that our cracked imperfect exteriors (in this instance his in particular) are nothing to be ashamed of — they are vital. A well glazed pot keeps the light in; only a pot riven with cracks can shine God’s light in the world. The cracks let the light out. 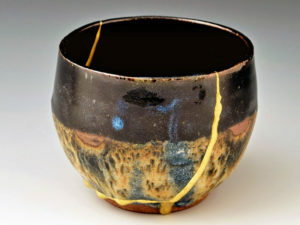 A slightly different image with the same idea is Kintsugi pottery, a Japanese practice which mends broken pots with gold or silver so that that resulting pot is more beautiful than the one that broke. In both cases, iy is through the cracks that the light shines through. As Christians, we are called to be who we are with all our cracks and imperfections, knowing that God’s glory will shine through those cracks into the world around us and that the gold of God’s love will mend our brokenness into something far more beautiful than it was before. We are called to be who we are with all our cracks and imperfections. The Christian calling is not a calling to perfection. I find it very freeing to know that I don’t have to walk on water, but instead we are called to be ourselves, and to live with our imperfections so that God’s glory can shine all the more powerfully. I know I’ll never be perfect; I can’t walk on water. Those expectations come from other people, or from myself. I want other people’s high opinion, and I don’t want to let people down. But I do let myself and others down; I’m human, I can’t walk on water. I don’t have to be perfect. You don’t have to be perfect. If perfection was the goal, I’d never step out of my house. I’d be too afraid about how I measure up to ever open the door. I’d obsess over everything I say or do and if I couldn’t measure up, I’d stay under my covers, afraid to face the world. If I had to be perfect. I’d be stagnant and frozen. That’s no life. Knowing we’ll never be perfect and don’t have to be perfect, means we can be those disciples in the boat, striving against the storm, even though they didn’t recognize Jesus. We can be the pots with cracks, because it’s through the cracks that God’s light shines forth. God made each one of us, with all our imperfections. God loves each one of us, with all our imperfections. God made each of us to be different. What God want is for each of us to be the wonderful, beloved, distinct individual we were created to be. He gave us guidelines Love God, Love your neighbour, and Love yourself. Same rules, but each has our individual way to let the light of love shine through. So be yourself, your beautiful, beloved self, and spread Love around.